It has been quite a journey for Tom Harrell after commencing his professional career playing trumpet in Stan Kenton's band in 1969. He recorded his first album as a leader in 1976 and currently has 30 albums under his belt including "Moving Picture." It has been written that Tom has participated in 260 recordings but they may include arranging as well which is another (sometimes overlooked) facet of his prodigious talent. Since signing with HighNote Records in 2007 Tom has been working primarily with a quintet but kept things fresh with a quartet recording,"Trip," a two-bass sextet on "Colors of a Dream" and the critically acclaimed "First Impresssions" which featured a nearly classical chamber ensemble playing the music of Debussy and Ravel. 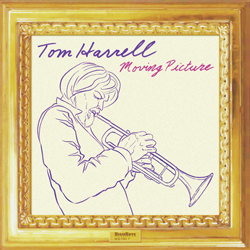 With "Moving Picture" Tom leads a quartet where he is the only horn, giving his legions of fans the pleasure of hearing more of his solo work backed by this venerable jazz format.